On 22nd and 23rd May, SITEC’s Online 100 staff attended the two-day event held at the Ministry of International Trade and Industry (MITI), organised by SME Corp Malaysia, Asia Pacific Economic Cooperation (APEC), Small and Medium Enterprise Administration Ministry of Economic Affairs (SMEA) and the Ministry of International Trade and Industry (MITI). The first session of the seminar was on “Driving Economic Growth through cross-border e-Commerce and Online to Offline (O2O) Business Model in APEC: Empowering MSME’s and Eliminating Barriers”. For this session, participants were exposed to the various incentives and assistance available in adopting e-Commerce from the Government and private sectors. They mentioned how important big data was to drive the O2O business model, how e-Commerce will create opportunities, and the support offered by the government. The second session was on “Cross-border Payments & Internet Finance” and “Manage your Online Store & Customer Service, Trust and Safety Service”. This session discussed the issue of trust in SMEs, especially on the payment issue, suggesting that setting up a payment gateway in e-Commerce platforms is one of the most important ways to gain trust for this business. The security of a payment gateway will increase the trust between the seller and buyer, especially in cross border e-Commerce. The third session was on “CBET Capacity Building”. The speaker for this session presented on “Cross-border e-Commerce Ecosystem and How to Start”. 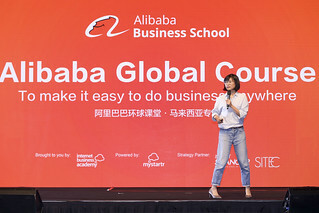 The speaker, from marketplace DHgate, shared the company’s experience on the cross-border e-Commerce along with some tips based on their merchants’ experiences. The fourth session was on International Logistics. This session saw Pos Malaysia, DHL and MooCommerce as panelists with moderator Sunny Ooi from ClickAsia. 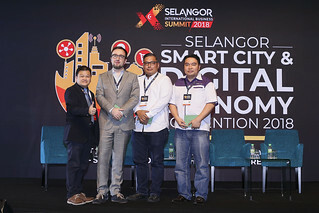 Pos Malaysia, who has the most couriers on staff in Malaysia, shared on their experience managing the daily parcel load, also discussing some issues such as pending deliveries and missing parcels, as well as how they have partnered with the DFTZ and Lazada Malaysia to become the number one courier service provider in Malaysia. They also mentioned what they can contribute regarding the DFTZ and Alibaba plan to be able to deliver within 72 hours in worldwide e-Commerce. DHL’s e-Commerce department also shared their experiences in handling parcels in cross-border e-Commerce. The couriers/logistic providers aim to upgrade the system in future to make the delivery faster and more efficient. Pos Malaysia is already building their parcel center in Shah Alam to make it a form of “Sorting Office”. 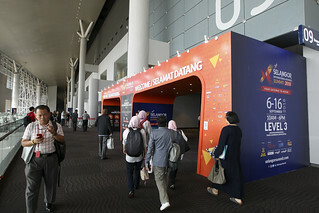 The fifth session was more a sharing session by delegates of APEC nations. Countries such as Chile, Mexico and Peru still have a lot to do to digitalise their business industries as, according to Peru’s representative, 98% of the businesses in their country have internet access, but only 7% are selling online. Mexico’s companies just increased their internet users by 35% over the past few years, While e-Commerce in Chile has increased by 10% from 2013 to 2016. Compared to those nations, Asian countries, especially Southeast Asian countries like Vietnam, Thailand and Malaysia, are acknowledged as having a stronger lead in the industry. The seventh session was the last session of the seminar, and it discussed O2O business models in cross-border e-Commerce. This session highlighted the many platforms that can assist SMEs to approach online to offline within their needs. The panelists from 11street and Avana shared stories of how some of their merchants had started their business online, but had set up a physical shop as well, saying that this increases the trust from buyers in the online side of their businesses. Some consumers use online platforms as an online catalogue, where customers can find information and start buying online.